Shell structures form key components in a very wide range of engineering enterprise. 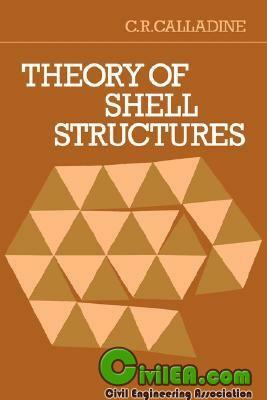 The theory of shell structures is an old and large subject, with a huge literature. However, this book is not a compilation of results from the past. Instead, it is an attempt to bring the essence of the subject within the grasp of engineers. It tackles the fundamental question of how bending and stretching effects combine and interact in shell structures from a physical point of view; and it shows that this approach leads to an understanding of the structural mechanics of shells in general, and to useful results in particular problems. The first half of the book is concerned mainly with the basic ideas and equations of equilibrium, geometry and elasticity, and their combination in various useful ways. In particular, it includes a simple treatment of the geometry of general curved surfaces. The second half of the book first investigates the behaviour of various practical shell structures under static loading. Then there are chapters on the buckling of shells, on vibration, and on the application of plastic theory to analysis and design. This book attempts to bring the essence of shell structures within the grasp of engineers. It tackles the fundamental question of how bending and stretching effects combine and interact in shell structures from a physical point of view; and shows that this approach leads to an understanding of the structural mechanics of shells in general.